With two public holidays coming up this month right before Bali’s rainy season officially starts, there’s no better time to pay the Island of the Gods a visit, says Gwen Pew. 14 Oct 2014: Kuta has long been known as the party and tourist central of Bali, but for those looking for somewhere more luxurious and away from the backpacking crowd, we’d suggest that you visit its northern sibling, Seminyak. The area is known for its upmarket lifestyle, and has no shortage of fashionable boutiques, chic restaurants and Instagram- worthy cafés. And should you find yourself tired, there are plenty of spas and bars to rest your tired feet – not to mention the fact that the sunsets along its fine grey beach are truly magical. But if you want to stay ahead of the curve, then venture even further north to Petitenget, home to some fantastic hang-out spots. We’ve trawled through the streets of both districts to revisit some time-honoured institutions and hunt down cool new establishments, so whether you’re a first timer or an annual visitor to the area, we’ve got you sorted. You’ve probably worked hard to get the perfect beach bod prior to your trip, but we’re telling you right now that the real reason you got fit before arriving is so you can guiltlessly enjoy all the food that this place has to offer. The first street you’ll hear about for good grub is Jalan Oberoi (also known as JalanLaksamana and Jalan Kayu Aya; the streets here tend to have several names, so be aware of that). There are a few cafés and brunch places on the stretch, such as Anomali Coffee (Jln Oberoi No 7B, +62 361 736687), the über-hipster Revolver (Gang 51, Jln Oberoi No 3, +62 361 7884968) and the gorgeous, brand-new Corner House (Jln Oberoi No 10A, +62 361 730276). Fancy foodies can head to Ku De Ta’s sophisticated dinner spot Mejekawi (Jln Oberoi No 9, +62 361 736969) or Urchin (Jln Oberoi No 22, +62 361 732413), a new Aussie-style raw bar and grill. But otherwise, we’d advise you to make the walk to Jalan Petitenget. The start of the area is marked by the synonymously named Petitenget Café (Jln Petitenget No 40X, +62 361 4733054), which is chilled out during the day and welcoming at night, while tea lovers should definitely check out Biku (Jln Petitenget No 888, +62 361 8570888), which is owned by the Australian princess of Ubud and boasts a fantastic collection of tea from India – and you can even book a tarot card reading session here. The Potato Head Beach Club (Jln Petitenget No 51B, +62 361 4737979), whose fine dining French restaurant, Tapping Shoes, has just been revamped as a bistro, is worth a visit, but for some delectable fine dining, you should book a table at the recently opened Bambu (Jln Petitenget No 198, +62 361 8469797). Their chefs, including several 60-plus-year-old aunties, come from all over Indonesia and their food is authentic and superb. Further into Petitenget, Barbacoa (Jln Petitenget No 14, +62 361 739233) is a great Argentinian place, Naughty Nuri’s (Jln Batu Belig No 41, +62 361 8476722) does excellent pork ribs, and Warung Eropa (Jln Petitenget No 98, +62 361 4732480) will satisfy your strongest crispy duck cravings. While it’s not as intense as Kuta, the nightlife scene in Seminyak is certainly alive and well. The biggest parties of the year usually happen in August at Ku De Ta, Potato Head and W Hotel (Jln Petitenget, +62 361 4738106), but the brand new Jenja (Jln Nakula No 532XX, +62 361 8827711) will call to your inner party animal. It’s known for its hip hop Wednesdays and house/techno Fridays, although we’ve heard that Monday nights are surprisingly fun, too. Jalan Oberoi is home to several newish places that opened last year for good drinks and better times: Red Carpet Champagne Bar (Jln Oberoi No 42C, +62 361 737889) is a fun, classy affair and claims to be ‘home to Indonesia’s largest champagne collection’, while La Favela (Jln Oberoi No 177X, +62 361 730603) also hosts great parties. And if you’re further up on Jalan Petitenget, pop into Hu’u Bar (Jln Petitenget, +62 036 14736576), which has been around since 2001 and has hosted a range of celeb DJs. For something a bit different, head on to Salty Seagull (Jln Petitenget No 999, +62 361 8497588), where crab racing takes place every Thursday night. And if it’s gay bars that you’re after, then head right on to Jalan Camplung Tanduk – you won’t miss them. As one hotel manager wisely advised the men, ‘Seminyak is a woman’s shopping paradise, so just give her the credit card and give up’. He was right. You can still find touristy knick-knacks, but the boutique shops here are generally classier – and pricier. There are three main shopping streets in the area: Jalan Raya Seminyak, and the aforementioned Jalan Oberoi and Jalan Petitenget. Ladies can treat themselves to something pretty at Biasa (Jln Raya Seminyak No 36, +62 361 730308), Innuendo (Jln Oberoi No 117, +62 361 841 0751) and Magali Pascal (Jln Petitenget No 900, +62 361 8469794), which are all founded by European designers based there. Those looking for something more hip and casual for both genders, head over to Somewhere (Jln Oberoi No 52, +62 361 9262981) and This is a Love Song (Jln Oberoi No 3, +62 361 9130713), or else pop over toSimpleKonsepStore (Jln Oberoi No 40, +62 361 730393), which stocks apparel as well as quirky accessories and designs. For non-fashion goods, Bathe (Jln Raya Batu Belig No. 88, +62 361 792 9779) has wonderful bath products, and if you forget to bring a book for the beach, the biggest local bookshop Periplus (Jln Kayu Aya No 1, Seminyak Square, +62 361 736851) will have you covered. Get your culture fix by paying the little beach-side temple, Pura Petitenget, a visit. It’s right by the beach and holds some beautiful ceremonies, but do be respectful of local culture as these rituals are sacred to the Balinese (a sarong is required for the ladies and any revealing clothing should be avoided, and be courteous when you’re taking photos). If you prefer something a bit more active, you – or your kids – can learn to surf at Rip Curl Surf School (Jln Arjuna, +62 361 735858), or else indulge in a massage. Many hotels have pampering five-star spas, but Body Works (Jln Kayu Jati No 2, +62 361 733317) has been around for 20 years and offers relaxing treatments without breaking the bank. And Think Pink Nails (Jln Batu Belig No 108, +62 361 9188116) is great for a mani-pedi – they even have a car that picks up and drops off customers staying in the area. And then, of course, there’s the beach. 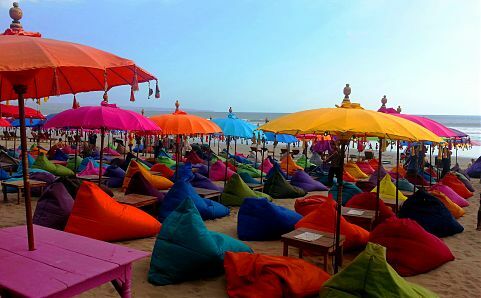 Few things are better in life than watching the sun dip into the ocean, so plonk yourself on the colourful beanbags at one of the many lovely beach bars and soak it all in. We especially love La Plancha (Jln Mesari Beach, +62 361 730603) on Double Six Beach. The traffic in Seminyak is notoriously nightmarish, yet the most comfortable way of getting around is still by car. Most resorts can sort you out with a set of wheels and a driver, but taxis are cheap and plentiful, too. Blue Bird is the most trusted cab company in the area, but whichever one you take, be sure you ask the cabbies to run the meter if you don’t want to be ripped off. A few brave souls do choose to take on the locals’ preferred mode of transport: motorcycles. A motorbike taxi will cost around $1 to get you from Seminyak to Petitenget, and for $5 you can rent that baby all day (excluding gas). But if you’re really skint, just use those legs and walk. Seminyak is not the most pedestrian-friendly of places, and pavements sometimes do just vanish in the middle of the road, but on the whole it’s definitely doable, safe and free. Rates on Skyscanner for AirAsia direct flights to Bali start from $241 return. Gwen Pew and Berwin Song check out three new properties of note in Bali’s Nusa Dua region. Photos can do no justice to the stunning Grand Nikko Bali. Image courtesy of the resort. 13 Nov 2013: On the east coast of the southern tip of Bali, the district of Nusa Dua is traditionally known as a gated enclave of swanky resorts, home to five-star properties such as the Conrad, Grand Hyatt Bali and the Westin. While there aren’t many sights in the area itself (the bland Bali Collection shopping complex is the only real retail centre in the area), the region is perfect for those looking for a quiet, all-inclusive getaway or resort conference – recently, both the 2013 Miss World competition and the security-heavy APEC summit were held inside the gated region. The district is also seeing increased development in the wide swathes of land outside of the gates, with numerous resorts in the works. Walking around the sprawling, stunning grounds of Grand Nikko Bali, you wouldn’t think that the resort is about to celebrate its 18th anniversary. Everything is kept in mint condition, the staff members are all friendly and attentive, and the facilities are top notch. The five-star resort was rebranded just a few months ago, following the refurbishment of all 389 guest rooms and the introduction of 19 villas that each boast their own private infinity pool with either an ocean or garden view (there are 17 one-bedroom, one two-bedroom and one threebedroom villa), plus an exclusive villa lounge, a ballroom and an open-air wedding gazebo. Guests staying at the villas are also welcomed to use the Nikko Club Lounge – a prime location to watch the sunrise over the Indian Ocean, enjoy a complimentary a la carte breakfast, or relax over canapés and cocktails at dusk – and get pampered by a range of treatments, such as the recommended two-hour Harmony massage, at the Mandara Spa. With four restaurants and a bar, as well as a range of other activities (including camel rides) and direct beach access, there is no real need to leave the Grand Nikko if you don’t want to, making it perfect for those who are looking for a truly private romantic getaway. 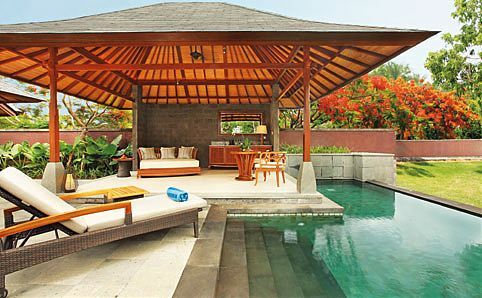 Guest rooms start from USD350++/ night; villas from USD650++/night. A discount of 33 percent off villas is available until March 2014. Seewww.grandnikkobali.com for details. The third property by luxury hotel group General Hotel Management (GHM) to open in Bali, the Chedi Sakala just started welcoming its first guests at the end of October, and officially opens this month. The resort occupies 2.4 hectares of land and is located right along the well-developed beaches of Tanjung Benoa at the northern end of Nusa Dua (inside the gated enclave), which features numerous water activies and sports. Impressively, all of the 247 guest rooms are suites; there are also 14 private one- and two-bedroom pool villas. Other facilities at the resort include two swimming pools, a wellness spa, health club, lagoon bar and kid’s club. An all-daydining restaurant serves up an international cuisine, while the Sakala Bali restaurant across the road from the resort provides a more upscale, contemporary French dining option. Guest rooms start from USD310++/ night; villas from USD800++/night. Seewww.ghmhotels.com/en/thechedi- sakala/home for details. One of the most affordable options in the area, Mantra Nusa Dua is the brand’s flagship resort outside of Australia (where they have 52 properties). While it doesn’t boast the all-out swankiness of some of the surrounding resorts (such as the ridiculously massive Mulia compound across the street), it’s great for a quiet getaway with wellsized rooms. There are 172 rooms in three categories, situated in two wings surrounding the centrepiece pool, which runs the length of the hotel (with an overhead walkway creating a few waterfall features that leads to their dining room). All rooms feature a balcony with an outdoor daybed and rain showers in the bathrooms. Superior and Deluxe rooms start at a relatively spacious 51sqm – the difference comes in the form of an extra sofa area or a bathtub, respectively. The top rooms are the suites (24 in total) – all sized at 102sqm and still significantly cheaper than most other resorts in the area. Though there’s no direct beach access, free shuttles are provided to Geger Beach, which is a threeminute drive away. Here, Mantra has a small area with a few beach chairs reserved specially for their guests. The resort is also home to the Chakra spa, a first for the Mantra brand, featuring their signature Chakra balancing massage (which involves a Tibetan singing bowl and Indonesian massage). Look out for more as Mantra expands in Asia, with plans for multiple properties across Bali (including their budget hotel Brand Free and the higher-end Peppers, the first of which will be a rebranded property taking over Sentosa Seminyak). Superior rooms start from USD99/ night; suites start from USD242/ night Seewww.mantranusadua.com for details.